Shopping groceries is one of those things that can be both boring and causing a lot of stress, especially when your store is located about a forty minutes walk from home. 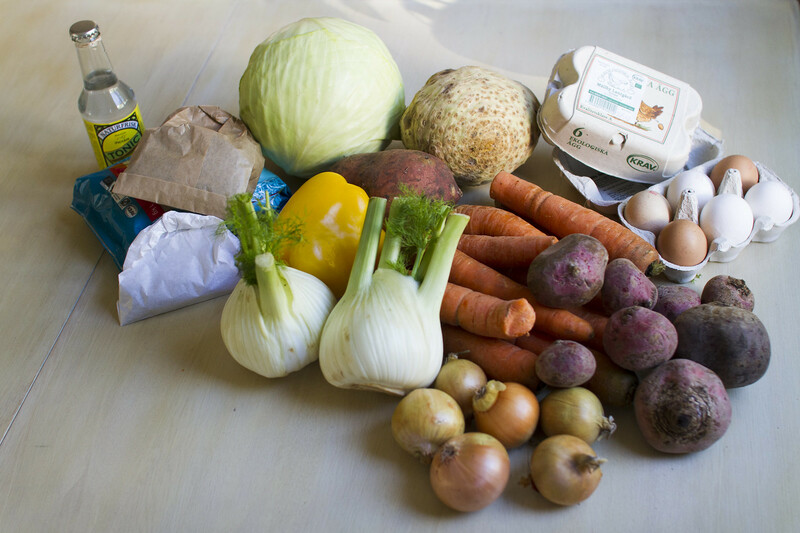 To get the best vegetables, spices, coffee and eggs we go to our favorite store FRAM. At FRAM they sell only organic products and if it is in season also locally produced. Some of the vegetables bought this time at FRAM. 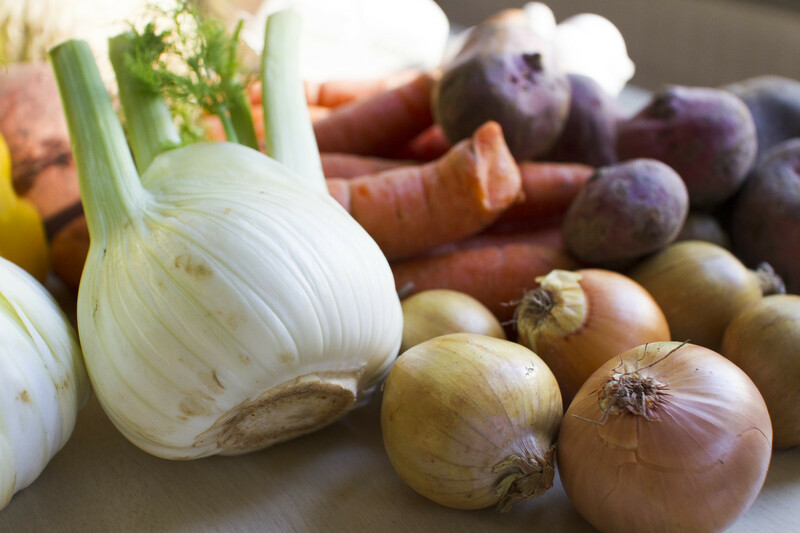 Nowadays it is actually possible to get the most common vegetables as organic in the local supermarket, however the freshness is miles apart from the ones we get at FRAM. Instead of having spent weeks in warehouses across the country, continent, you name it, FRAM has a reasonably short supply chain it seems. The products are always really fresh and usually last for weeks in the fridge. This should be compared to the ones that we by at the supermarket, which can get rotten in less then a week, depending on how lucky we are. Unfortunately one has to limit the shopping to what is reasonable to carry home. An additional bonus with buying fresh vegetables is that they contain more healthy nutrients and phytochemicals and they also taste better! I usually take the bike to get there, or during the winter I have walked the hour back and forth. If Cecilia happens to take that way home from work she usually passes on her journey with the trams and busses. At FRAM they have this wonderful concept that if you walk, cycle or travel by public transport and buy for more than 800 kr (roughly €80) you get a 10 % discount on your whole purchase. We have only managed that a few times, since that amounts to quite a lot of vegetables. But buying some nice chocolate, spices or nuts can help. 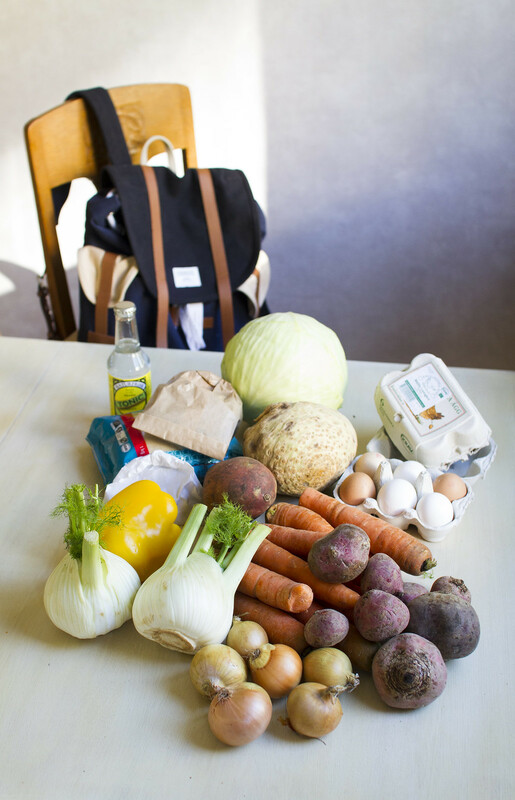 This Monday I took the bike there and came back with this wonderful lot of vegetables, eggs and also some Kombucha ingredients. And some organic tonic… To our occasional weekend treat, gin and tonic. 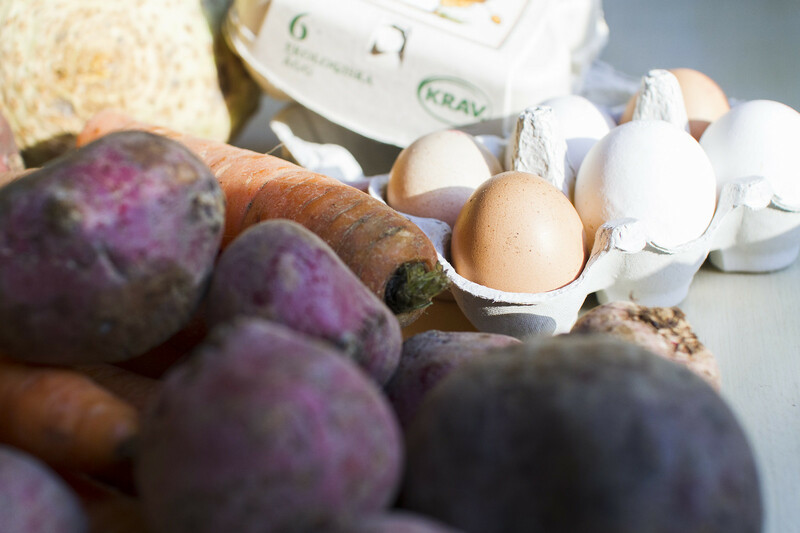 One would also expect that there shouldn’t be too much of a difference between the supermarket’s organic eggs and the one at FRAM, but you would be surprised. It is like day and night. Even the egg whites of the FRAM eggs have this wonderful richness to them and the yolks have a completely different character. The eggs from FRAM are amazing. If you find yourself in Gothenburg we really advice you to pay FRAM a visit! Where do you get your groceries and vegetables?